After several (amazing) days of beach time, salads and snack-y food, I was looking forward to this classic summer combo. My Gluten-Free, Vegan take on it… Hilary’s Veggie Burger topped with the creamiest avocado & a basket full of crispy baked fries. We love Hilary’s Veggie Burgers for quick and easy meals. Certified Gluten-free, Organic, Vegan, made with minimally processed ingredients, free of common allergens, DELISH and… all you have to do is heat them up! (I like mine sautéed 3 minutes each side or grilled 5 minutes each side). A simple and easy Summer meal! 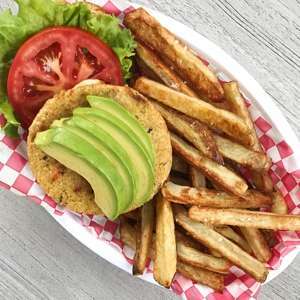 Hilary's Veggie Burgers and Crispy Baked Fries with all the toppings make for a simple, nourishing and great tasting meal, free from common allergens, in 30 minutes. Sponsored by Hilary's Eat Well. Prepare according to package. I love preparing it stove top or on the grill for a crispy topping. Make sure potatoes are well dried. Cut potatoes into strips. You want to cut your fries or wedges into even sizes so they cook evenly. Mine were approximately 3 inches long x ½ inch thick but they can be any size. Place fries in a large bowl and toss evenly with oil. (You want the fries to be coated but not dripping in oil). Place oiled fries in a single layer on ungreased baking sheet or baking sheet covered in non stick foil. Make sure fries are not touching and that there is room between each so that they can get crispy. Roast for 15 minutes, flip, and roast an additional 5-10 minutes until crispy on outside and tender on inside. The time will vary depending on thickness of fries and how crispy you like them.